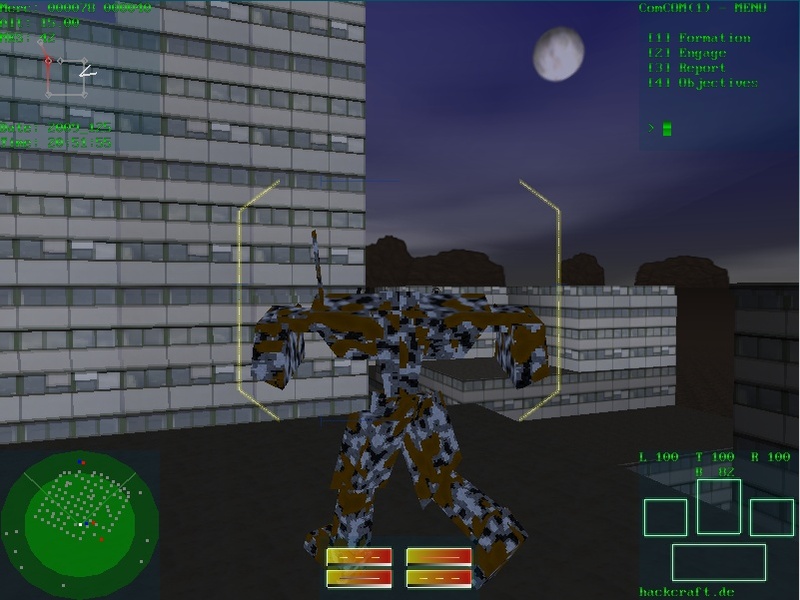 On this page you can download stable (and older) builds of the LinWarrior 3D opensource mech simulation game. Please note that this game is under development and probably will be for a long time. Don't compare it to something complete you have to pay for. The latest (usually stable!) code can be found in the publicly available GIT repository. The newest release including Windows-Binaries is 20091108. Newer releases are source only. Search the web for "openal downloads" to find Windows-DLLs at creativelabs. You don't need NetBeans IDE (6.9) in order compile the soure - "make clean all" is enough. And it is recommended to recompile. If you encounter random segmentation faults at startup then your distribution may still use the old OpenAL-Standard-Implementation (SI). This can be solved this by using OpenAL-Soft instead. You may need to tune OpenAL-Soft to get usable performance. This will already create a new linwarrior directory in your current directory and download the source-tree. As for now this git-repository contains *all* datafiles - expect this to change. But it will always contain all *necessary* datafiles for basic operation. This release introduces GLEW as an additional dependency. 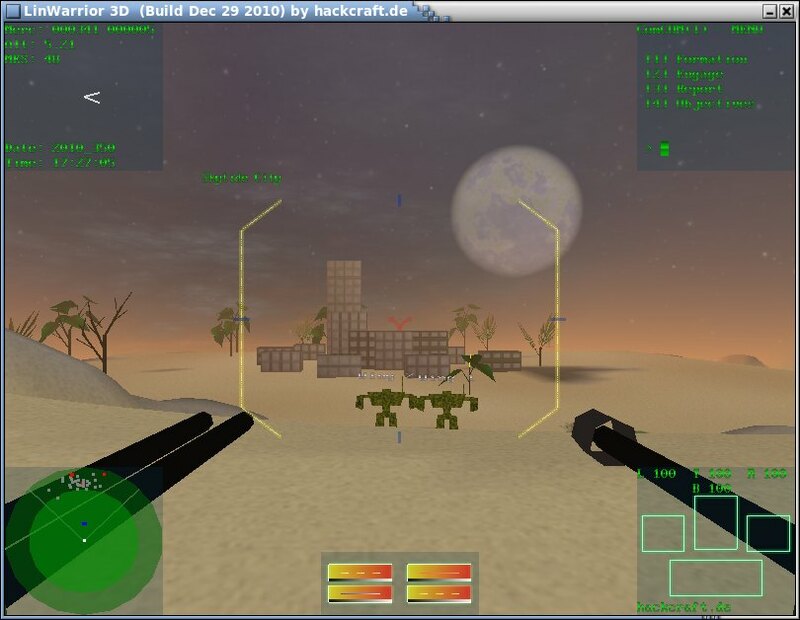 GLEW the Open GL Extension Wrangler makes using OpenGL-Extensions painless and portable. The previous release added some procedural content and development at that frontier is going on with this release. This release turns out to be a lot about graphics but there are some important steps towards a game. Notably there is some beginning of a story, a mission and finally a loadscreen. Behind the scenes there where changes for handling game events and towards an integrated editor. And yet there is a long way to go. - Awesome Night-Sky - don't miss. 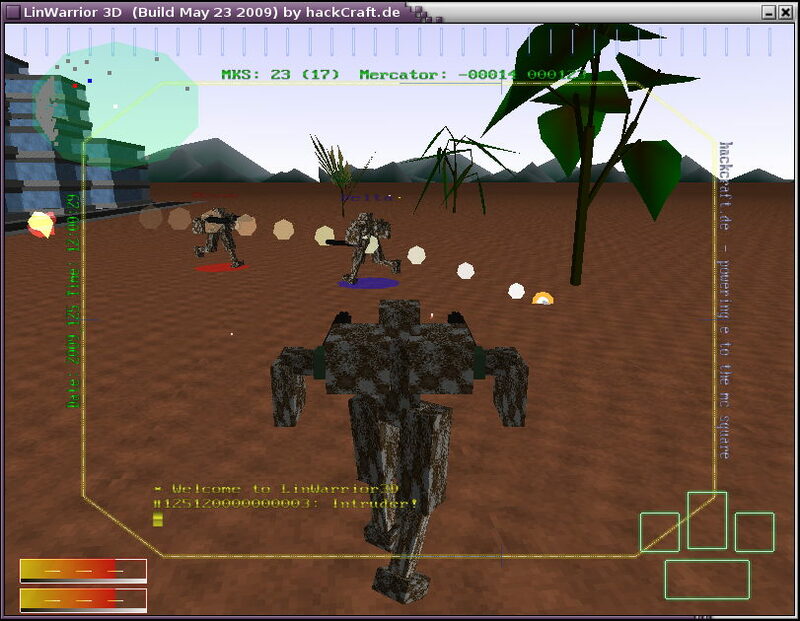 - Mapping of mouse to virtual gamepad for targeting. - Antialiasing/Multisample through option "--samples n" or short "-s n" with n 0 2 4. 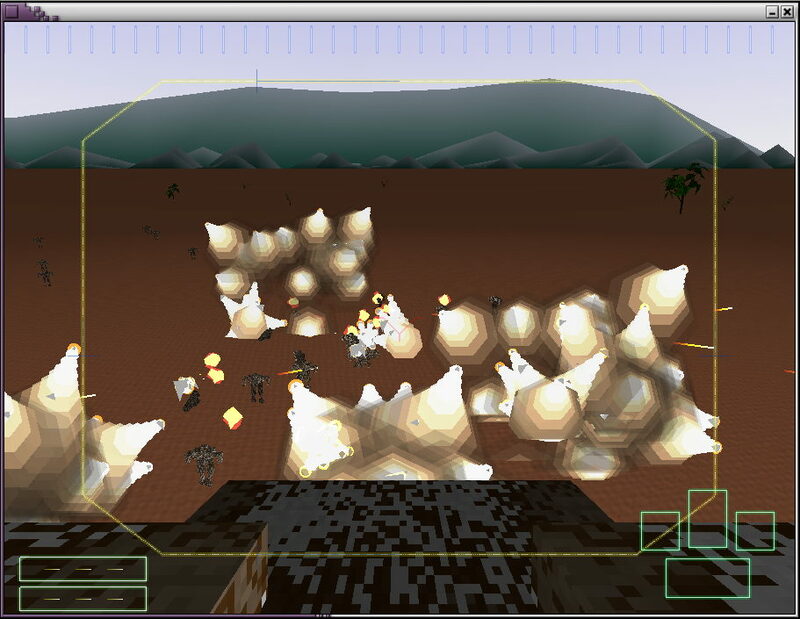 This release features some preliminary heightmap terrain along with some graphical improvements and mouse aiming. The new terrain does not only add more visual detail but enhances gameplay a lot: More possibilities to duck and cover. Height differences can be used to your advantage. - textured sun and moon. - mystic textured mountains on the horizon. - Textures are unter CC-BY-license. - Pure Physics - no fake (maybe some minor). - Collision Detection + Correction faster and easier. - No more sticking on walls - ai can walk "around" obstacles. - There is no spoon - just particles. 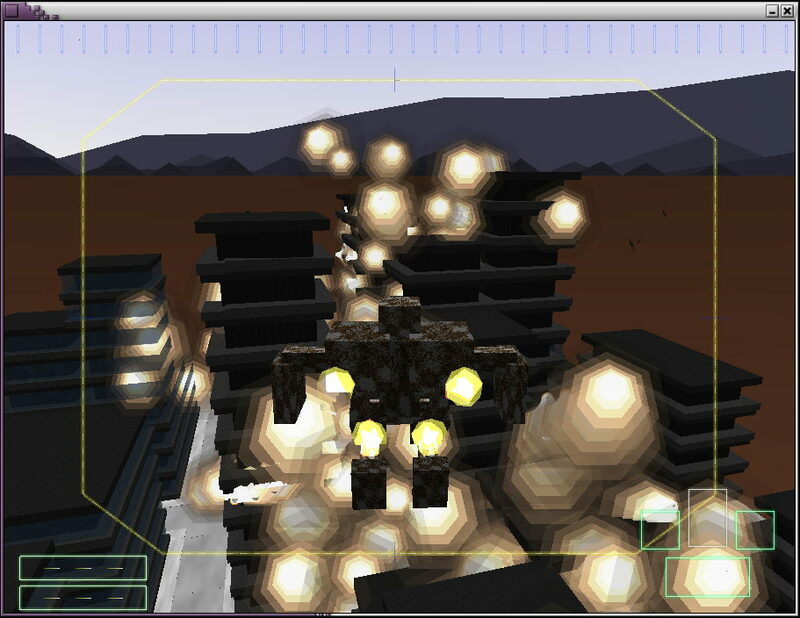 - Rays emulated through particle-trails. - No more shooting through buildings. - More vehicle types to come. - Easy moddability and community support (Blender and now MisfitModel 3D). - MD5Format-Exporter for MisfitModel 3D included. Fixed a font-rendering bug on 64bit systems. + Now log/linear hybrid radar. + Bound animation to velocity. + Reintroduced sun and moon. + Now simple textured buildings and roads with streetlamps. 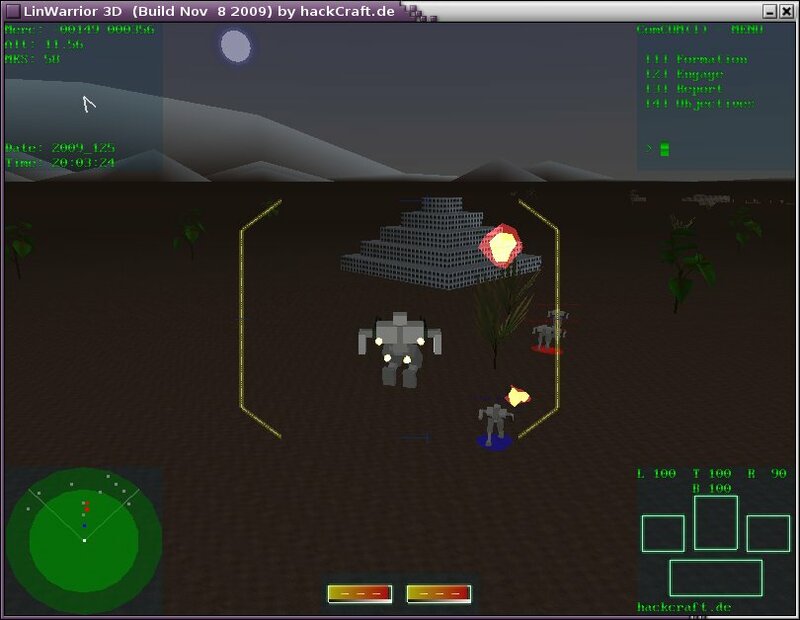 + Added switchable view distance (1-9, 0 unlimited). 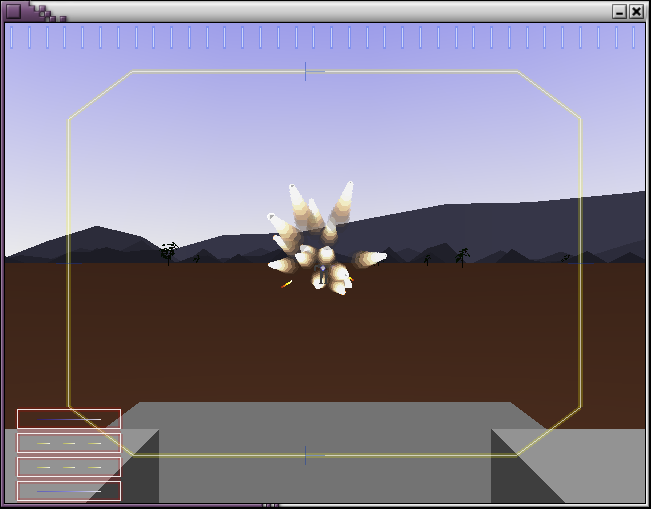 + Reintroduced enemies targeting upwards. + Includes linux- and win-binary. + Preparations for further changes. + Spatial clustering of units => faster object filtering. + Initial PVS, faster collisions => larger/detailed landscapes possible. + Unit move- & aim-targets. + Can run w/o sound when device busy. + Weapons sounds, vocal power-up sequence. + Visual weapon modells (animated). + Ammo and clips reloading. 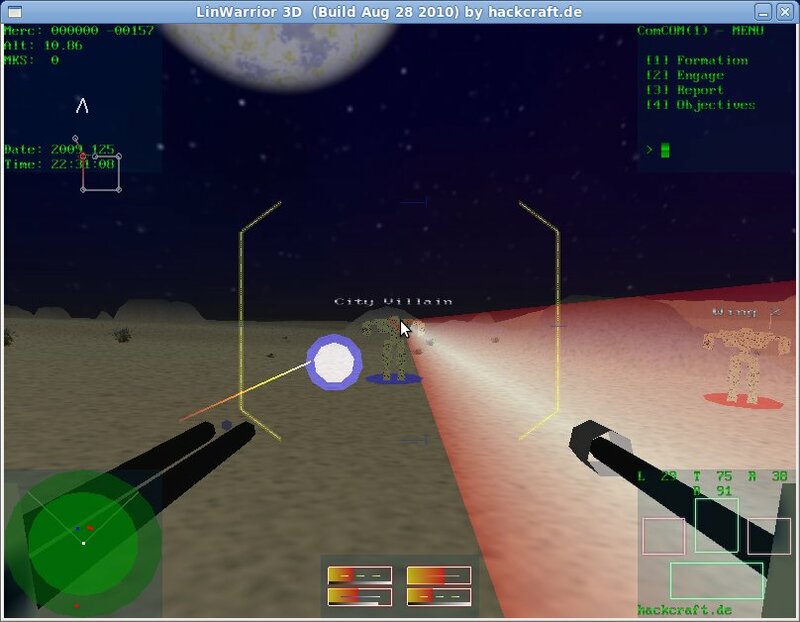 + Ammo and clips in Weapon-HUD. + Try all weapons in --mission 2. + Preliminary Doxygen comments and config-file. + WAIT-Opcode with timeout for AI-Stack-Engine. + First campaign mission underway (--mission 2). 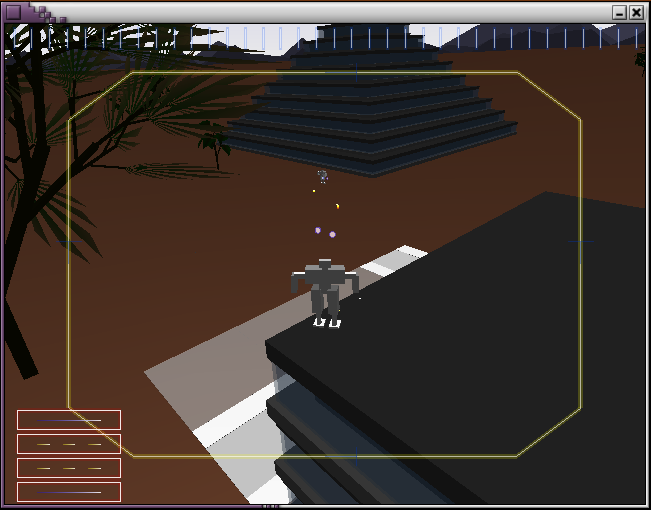 + Added Simple 3D-Texturing (no 2D-Texturing). + GoTo and Repeat-Opcode for AI-Stack-Engine. 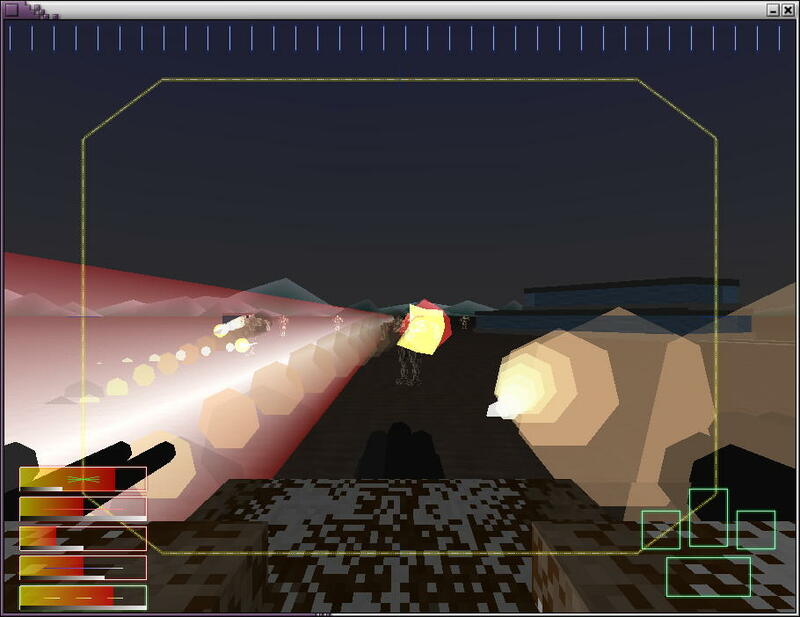 + Improved Head Up Display. + SDL and Gamepad support. + Contains (Linux) NetBeans C++ Project. + Hand compiled Windows binary. + Further refactoring and work towards SDL support but still GLUT. + Major source clean up and refactoring. + Now using NetBeans C++ for Project-Workspace. Finishes the LinWarrior Classic Line after a long idle time. First release version, mainly programmed over winter holydays 1999.